Active suppression by T regulatory cells plays an important role in the down-regulation of T cell responses to foreign and self-Ags. Thus far, the potential role of CD4+CD25+ T cells in human tumors has not been reported. In this work we show that lung tumors contain large numbers of these cells and that they have constitutive high-level expression of CD152 (CTLA-4). Furthermore, the CD4+CD25+ T cells mediate potent inhibition of autologous T cell proliferation. Finally, regulatory T cells from patient tumors failed to inhibit the proliferation of allogeneic T cells. Together these results suggest that the CD4+CD25+ T cells found in lung tumors selectively inhibit the host immune response and therefore could contribute to the progression of lung cancer. It has long been thought that suppressor cells play a role in the progression of cancer (1). More recently, it has been demonstrated that suppressor cells bear the phenotype CD3+CD4+CD25+ (2, 3, 4, 5, 6, 7). Although immunoregulatory CD4+CD25+ T cells function beneficially in vivo to protect the host against the development of autoimmunity, they may simultaneously prevent the host from mounting an immune response to autoantigens such as tumor Ags. Thus, a preponderance of these regulatory T cells could lead to a failure of tumor immunosurveillance or to enhanced tumor growth. We have previously shown that CD4+CD25+ T cells exist in high proportions in the tumor-infiltrating lymphocytes (TIL) of patients with non-small cell lung cancer (NSCLC)4 (8). We now demonstrate that these cells uniformly express high levels of CTLA-4 on their cell surface. In addition, CD4+CD25+ T cells isolated from tumors mediate potent inhibition of the proliferation of autologous peripheral blood T cells stimulated by anti-CD3 or anti-CD3/anti-CD28. These regulatory T cells may play a role in inducing or maintaining tolerance to tumors in patients with lung cancer, and manipulation of this subpopulation could be an important component of cancer immunotherapy. Peripheral blood and tumor were collected from patients with either stage I or II NSCLC after obtaining appropriate informed consent under Institutional Review Board approved protocols. Tumor specimens were collected at the time of surgery and processed by sterile mechanical dissection followed by enzymatic digestion, as described (8). Cells were separated on a Percoll (Pharmacia Biotech, Uppsala, Sweden) density gradient. Peripheral blood was obtained at the time of tumor collection, processed as described (8), and frozen. Enrichment of CD3+CD4+CD25+, CD3+CD4+CD25−, or CD3+ (−CD4+CD25+) cells was performed on a MoFlo Cell Sorter (Cytomation, Fort Collins, CO) by gating on lymphocytes, CD3+CD4+ T cells, and the respective CD25 population. A total of 70,000 CD3+CD4+CD25+ or CD3+CD4−CD25− cells were placed into 96-well plates (Falcon, Franklin Lakes, NJ) for a 2-day culture in 200 μl total volume. Supernatants were then harvested and tested for cytokine production using Quantikine human TGF-β, IL-2, and IL-10 ELISA kits (R&D Systems, Minneapolis, MN). Ninety-six-well plates were coated with 1 μg/ml anti-CD3 (9) or 1 μg/ml anti-CD3 and anti-CD28 (10) Ab overnight at 37°C. PBLs from patients or normal donors were thawed and cultured in RPMI 1640 10% FCS (HyClone Laboratories, Logan, UT) at 5 × 104/200 μl per well in triplicate at 37°C 5% CO2. 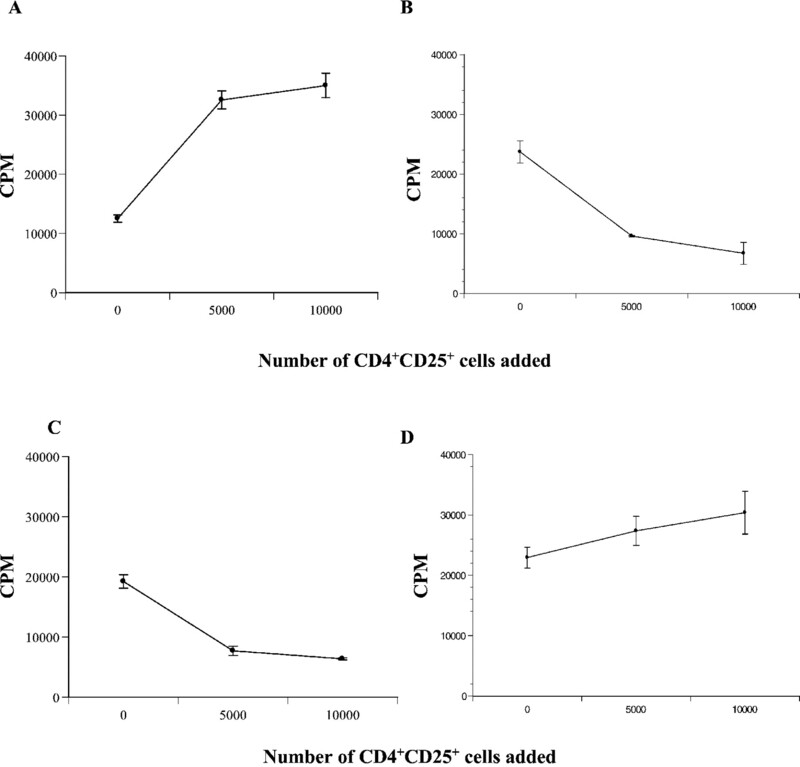 Purified CD3+CD4+CD25+ or CD3+ (−CD4+CD25+) T cells were added at varying numbers (0–20,000). Blocking experiments were performed with 10 μg/ml anti-TGF-β Ab (R&D Systems). Proliferation was assayed by measuring [3H]thymidine incorporation (3). Fresh tumor specimens from eight patients with NSCLC were digested and the TIL analyzed by flow cytometry (Fig. 1⇓). A total of 33% of the TIL were CD4+CD25+, consistent with the activated phenotype of regulatory T cells. Of note, the peripheral blood of patients with NSCLC had a similar increase in the percentages of CD4+CD25+ cells. In contrast, <15% of the PBLs of normal donors had this phenotype, consistent with previous reports (11, 12, 13, 14). Frequency of CD4+CD25+ cells in tumor specimens and PBL of lung cancer patients. The percentage of CD4+CD25+ lymphocytes present in total CD4+ cells isolated from lung cancer specimens or peripheral blood was determined by flow cytometry. Distributions and means are shown: PBL of normal donors, n = 7 (left); unstimulated TIL from patients with NSCLC, n = 8 (center); or unstimulated PBL from patients with NSCLC, n = 9 (right). Values of p were calculated using the Student two-tailed t test. Recent studies have shown that CTLA-4 is up-regulated on mouse and human regulatory cells (12, 14, 15). Therefore, we analyzed the lymphocytes from normal donors and NSCLC patients for expression of CD4, CD25, and CTLA-4 by flow cytometry. In resting T cells from normal donors, <1% of T cells were positive for CTLA-4 expression (data not shown). Bright surface expression of CTLA-4 was detected on resting lymphocytes derived from the tumor specimens (Fig. 2⇓). Among the CD4+CD25+ cells from tumor specimens, 80% were positive for CTLA-4. 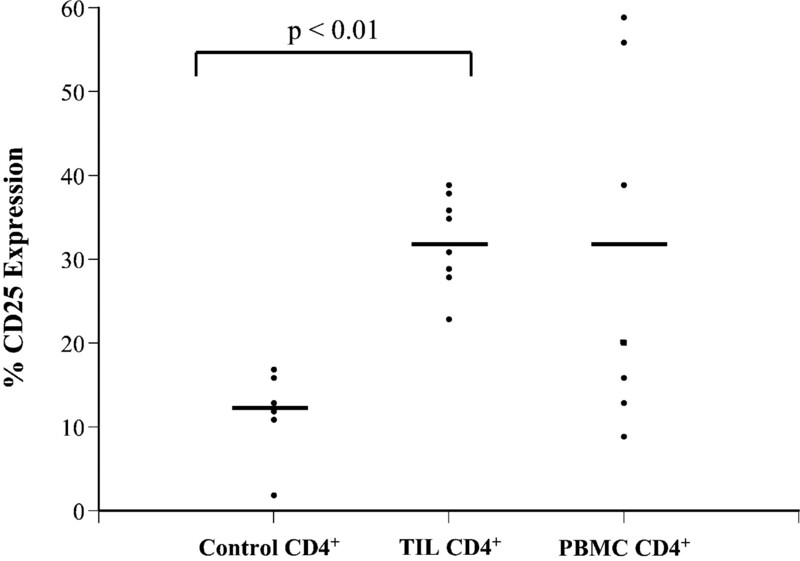 In contrast, <10% of the CD4+CD25− lymphocytes in the tumor specimens were positive for CTLA-4. To exclude the binding of shed CTLA-4 to B7 molecules that are expressed on activated human T cells (16), CTLA-4 mRNA was measured by quantitative PCR. We observed substantially (2- to 7-fold; n = 3 patients) higher levels of CTLA-4 mRNA in the CD4+CD25+ cells than in the CD4+CD25− cells (data not shown). In contrast to the near-uniform expression of CTLA-4 on CD4+CD25+ cells in tumor specimens, only 30% of the peripheral CD4+CD25+ cells from lung cancer patients stained positive for CTLA-4 (Fig. 2⇓). 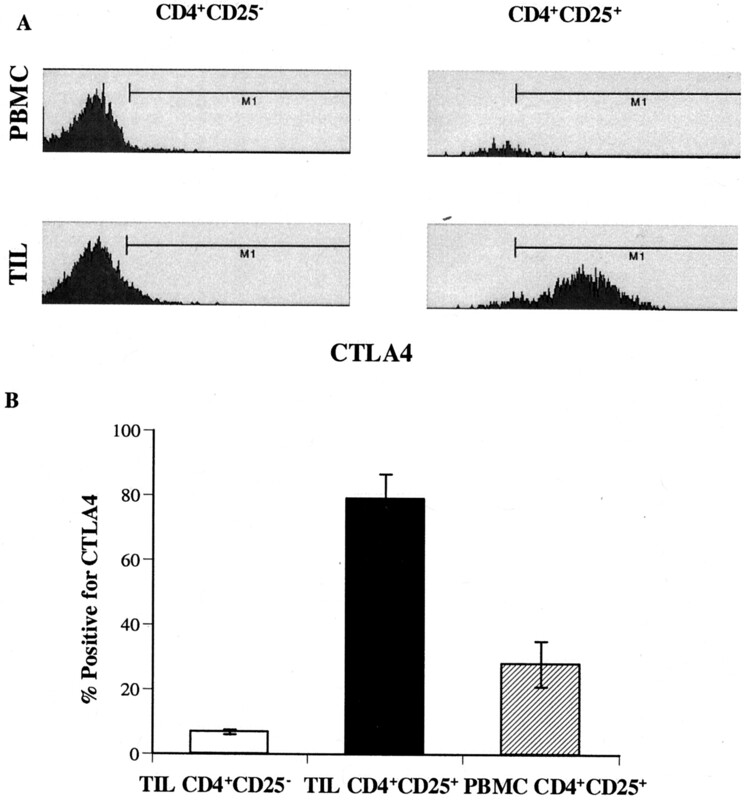 Increased CTLA-4 expression in tumor-infiltrating CD4+CD25+ cells. A, Flow histogram from two representative patients demonstrating CTLA-4 expression in CD4+CD25− and CD4+CD25+ TIL and PBMC. B, The mean (± SE) percentage of cells expressing CTLA-4 in CD4+CD25− TIL (left), CD4+CD25+ TIL (middle), and CD4+CD25+ PBMC (right) from five consecutive NSCLC patients is shown. To assess the function of CD4+CD25+CTLA-4+ cells in lung cancer patients, we separated CD4+CD25+ cells from the remaining TIL by high-speed cell sorting and determined their proliferative capacity and their effect on T cell proliferation. Regulatory T cells typically fail to proliferate in response to mitogenic stimulation (17). To confirm this, 50,000 CD4+CD25+ or CD3+ TIL depleted of CD4+CD25+ cells were stimulated with immobilized anti-CD3 and anti-CD28. As expected, the CD3+ cells depleted of CD4+CD25+ cells proliferated while the CD4+CD25+ cells did not (data not shown). Next, autologous PBLs were stimulated under suboptimal or optimal conditions in the presence of increasing numbers of the putative regulatory cells. CD4+CD25− TIL were added to control cultures. Suboptimal proliferation was induced with soluble anti-CD3 or immobilized anti-CD3, and optimal proliferation was induced with immobilized anti-CD3 and anti-CD28. As anticipated, soluble anti-CD3 stimulated low levels of proliferation, and inhibition of soluble anti-CD3-stimulated proliferation was seen with the addition of CD4+CD25+ T cells (Fig. 3⇓A). Immobilized anti-CD3 induced more vigorous proliferation, and there was a dose-dependent decrease in T cell proliferation with the addition of CD4+CD25+ cells. However, in contrast to previous reports in mouse T cells (5), optimal proliferation stimulated by anti-CD3 and anti-CD28 was also suppressed by addition of as few as 10–20% CD4+CD25+ lymphocytes derived from the lung cancer specimens (Fig. 3⇓B). The inhibition was potent. In five consecutive patients, the addition of 10,000 CD4+CD25+ T cells to 50,000 autologous PBL yielded a 60% mean inhibition of anti-CD3/CD28-stimulated proliferation of autologous PBL. 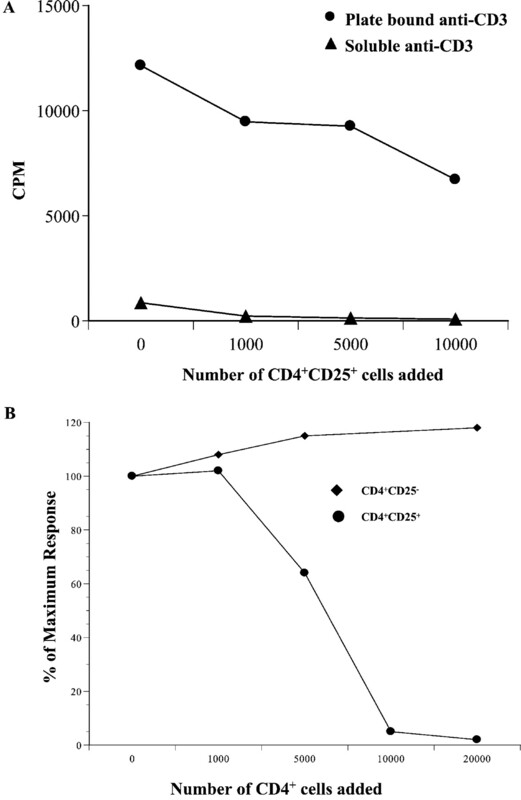 In contrast, neither CD3+ TIL depleted of CD4+CD25+ cells (Fig. 3⇓B) nor irradiated PBL (data not shown) cultured with responder cells suppressed proliferation of autologous PBL, demonstrating that the effects were not due to space or nutrient deficiencies. Direct inhibition of anti-CD3- or anti-CD3/CD28-induced autologous T cell proliferation by tumor-infiltrating CD4+CD25+ cells. Autologous PBL were cultured alone or with increasing numbers of sort-purified CD4+CD25+ or CD4+CD25− TIL from lung cancer specimens, and the cells were stimulated with soluble or plate-bound anti-CD3 (A) or with plastic immobilized anti-CD3/CD28 (B). [3H]Thymidine incorporation was measured during the last 18 h of a 4-day culture. Results are expressed as the percentage of response of PBL cultured alone; 100% proliferation was 37081 ± 4094 cpm for the CD25− plot and 29465 ± 1007 cpm for the CD25+ plot. We also tested the ability of freshly isolated CD4+CD25+ T cells from tumors to inhibit the proliferation of peripheral blood T cells from normal donors or unrelated cancer patients. CD4+CD25+ T cells were unable to inhibit the proliferation of anti-CD3/anti-CD28-stimulated PBL from normal donors (Fig. 4⇓A); there was actually an enhanced proliferative effect with increasing numbers of CD4+CD25+ T cells. In a companion culture, we confirmed the inhibitory function of this population of tumor-derived CD4+CD25+ T cells, as they were able to inhibit the anti-CD3/28-induced proliferation of autologous PBL (Fig. 4⇓B). Tumor-infiltrating CD4+CD25+ cells fail to suppress T cells from allogeneic normal donors or lung cancer patients. Allogeneic peripheral T cells from normal donor (A) or autologous (B) PBL from a NSCLC patient were cultured with the indicated numbers of tumor-infiltrating CD4+CD25+ cells from the cancer patient. C, Peripheral blood T cells from a normal donor were cultured with autologous sort-purified peripheral blood CD4+CD25+ donor T cells. D, Tumor-infiltrating CD4+CD25+ or CD4+CD25− cells were cultured with allogeneic PBL from a NSCLC patient. All cell cultures were stimulated with plate-bound anti-CD3/CD28. [3H]Thymidine incorporation was measured during the last 18 h of a 4-day culture. Results are expressed as means of triplicate cultures (± SE) for one of three (A), two (B and C), or four (D) independent experiments, each with similar results. Similar to tumor-derived CD4+CD25+ T cells, we found that the proliferation of normal donor responder PBL could be suppressed by culturing them with increasing numbers of autologous CD4+CD25+ T cells isolated from the peripheral blood (Fig. 4⇑C). Finally, we found that tumor-derived CD4+CD25+ cells from patient A cannot inhibit the proliferation of PBL from patient B, an unrelated NSCLC patient (Fig. 4⇑D). Together these experiments indicate that that the regulatory T cells infiltrating tumors potently suppress the mitogen-induced proliferation of autologous T cells while they cannot suppress the proliferation of allogeneic PBL. Finally, we sought to determine whether TGF-β secretion by the regulatory T cells isolated from tumors contributed to their suppressive function. Unstimulated, sort-purified CD4+CD25+ T cells constitutively produced significant amounts of TGF-β (Fig. 5⇓A), but production of IL-2 and IL-10 was undetected by ELISA (data not shown). 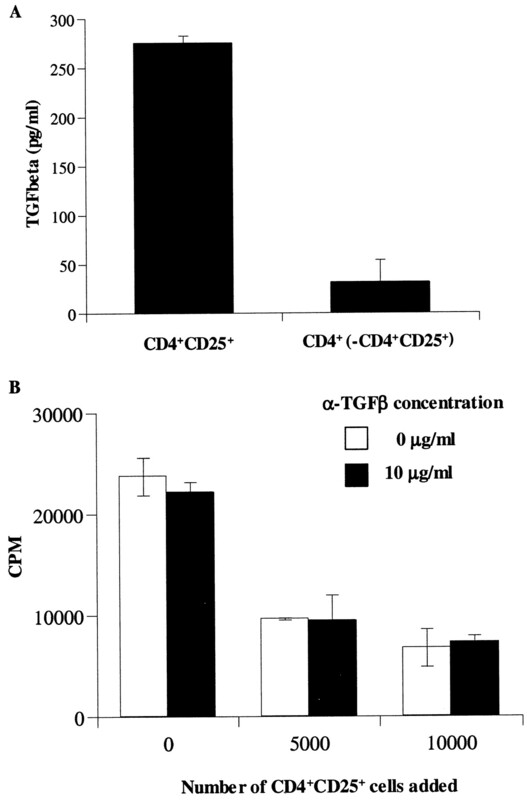 The addition of 10 μg/ml anti-TGF-β Ab, sufficient to neutralize the effects of 50 ng/ml TGF-β, did not abrogate the suppressive effect of CD4+CD25+ T cells on anti-CD3/28-induced autologous PBL proliferation (Fig. 5⇓B). Constitutive TGF-β secretion by tumor-infiltrating CD4+CD25+ cells is not required for inhibition of autologous PBL proliferation. A, CD4+CD25+ and CD3+ cells depleted of CD4+CD25+ cells from lung cancer specimens were placed in culture for 2 days. Supernatants were tested for TGF-β by ELISA. Results are representative of one of six patients (± SE for triplicate wells). B, Autologous PBL were cultured alone or with varying numbers of CD4+CD25+ cells and stimulated with plate-bound anti-CD3/CD28. Anti-TGF-β neutralizing Ab was added at 0 and 10 μg/ml. [3H]Thymidine incorporation was measured during the last 18 h of a 4-day culture. Results are expressed as means of triplicate cultures (± SE) for one of two independent experiments with similar results. In this study, primary lung tumor specimens from patients with early stage lung cancer were found to harbor large numbers of T cells with the phenotype previously ascribed to regulatory T cells. In contrast to previous descriptions of regulatory T cells, the CD4+CD25+ lymphocytes in tumors have striking surface expression of CTLA-4 and they directly inhibit proliferation of autologous but not allogeneic T cells. This suppressive effect of the tumor-resident CD4+CD25+ T cells was potent and occurred even after vigorous activation of the responding T cells. Previous studies have shown that CD4+CD25+ cells were able to inhibit anti-CD3 stimulation of T cells when cocultured with autologous APC, but only through direct contact (3, 4, 5). However, in mice this inhibitory effect was not able to overcome direct T cell stimulation with immobilized anti-CD3 or with anti-CD3/CD28 (5). Human CD4+CD25+ T cells isolated from peripheral blood required preactivation to reveal their suppressive properties, as direct culture of the regulatory cells was generally insufficient to mediate suppressive effects (14). Others have also found that the inhibitory properties of human CD4+CD25+ T cells are activation dependent but Ag nonspecific (12, 13, 18). After TCR-mediated stimulation, CD4+CD25+ T cells suppress the activation of naive CD4+CD25− T cells activated by alloantigens and mitogens (13). Of note was the striking surface expression of CTLA-4 that we observed on the T regulatory cells found in human lung cancer specimens. Previous studies have demonstrated constitutive expression of intracellular stores of CTLA-4 (12, 15, 18, 19). The explanation for the striking surface CTLA-4 expression that we observed in the tumor-infiltrating CD4+CD25+ T cells is not yet clear, although it most likely reflects vigorous ongoing activation of the cells in the tumor microenvironment, perhaps by tumor Ags. Our finding of large numbers of cells with the phenotype of regulatory T cells in patients with early stage lung cancer has implications both in the pathogenesis and in the design of immunotherapy. Most literature states that the immune system is either in a state of ignorance to peripheral solid tumors or anergic (20, 21). The abundant tumor-infiltrating CD4+CD25+ lymphocytes observed in our patients indicate the existence of natural immune response. Unfortunately, this immune response is likely to promote a local immunosuppressive effect. A recent study in mice suggests that the efficacy of therapeutic cancer vaccination in mice can be enhanced by removing CD4+CD25+ T cells (22). The explanation for the differential ability of the CD4+CD25+ T cells to suppress autologous and allogeneic T cell proliferation is most likely complex. Previous studies have shown that CD4+CD25+ T cells prevent allograft rejection, both in vitro and in vivo (23, 24). Allogeneic stimulation of human T cell proliferation is also blocked by CD4+CD25+ T cells (18). It is possible that the suppression of autologous T cell proliferation is in part tumor Ag specific; this possibility could be tested by determining the effect of the CD4+CD25+ cells on the proliferative response to exogenous recall Ags and tumor Ags. Wood et al. (23) have shown that CD4+CD25+ T cells suppress MLRs, but only when the alloantigen was presented by the indirect and not the direct pathway of allorecognition. It is likely that direct Ag presentation occurs between the regulatory T cells and the anti-CD3/28-stimulated responder T cells, as the sorted CD4+25+ cells are highly depleted of professional APC. We have shown that regulatory T cells resident in lung tumors can produce TGF-β and not IL-10 at baseline. It is possible that these cells are Th3 cells (25). TGF-β has been postulated as a source of tumor-induced immunosuppression. The mechanism of TGF-β production may be mediated, in part, through engagement of the CTLA-4 molecule (3, 15, 26). Whether CTLA-4 is simply a marker for regulatory T cells in cancer patients or whether it serves some functional property, such as TGF-β production, is unclear at this time. Our data clearly indicate that the addition of 20% of freshly isolated CD4+CD25+ T cells was able to significantly inhibit the proliferation of autologous T cells, even after vigorous stimulation of the T cells. Given that >30% of CD4+ TIL consist of CD4+CD25+ cells, these lymphocytes could certainly exert a suppressive effect in the tumor environment. In summary, CD4+CD25+ regulatory T cells exist in increased proportions in the TIL of patients with NSCLC. As these regulatory T cells may be playing a role in cancer progression or may present a barrier to immunotherapy, future strategies should be directed toward controlling their function. We thank the patients for donation of tissue and blood samples, and we thank William DeMuth and Dr. David Allman for expertise with flow cytometry and sorting. ↵1 This work was supported in part by the Bill and Melinda Gates Immunotherapy Program. ↵2 E.Y.W. and H.Y. contributed equally to this work. ↵4 Abbreviations used in this paper: NSCLC, non-small cell lung cancer; TIL, tumor-infiltrating lymphocyte.